2 rings, located fore and aft, each having three adjustable screws arranged around the circular ring. It reminds me of the bearing alignment between turbine shafts and generator shafts. Each machine needs alignment before the two are connected together. I'm still tweaking and struggling. Now, I'm packing up to attend the American Physical Society general meeting in Baltimore and won't get any observing in until late next week. It will be fun, surrounded by several thousand physicists, hearing the latest findings on dark matter, dark energy, galaxy formation and evolution, inflation, etc. Thanks to Ken for some recommendations. The rumor is that some big announcement about finding the dark matter particle will be made. I'm not holding my breath, but I'll let you know if I hear anything. 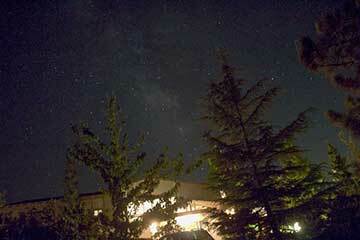 I'll also miss this Saturday Black Star canyon star party too. Good luck to the two Daves' and any others attending that event. Also, it's not like Peggy and Danny are left in charge of the observatory while I'm gone. It's really more like they are normally in charge and I get to go out and do remote study occasionally. Just like last week when I wanted to just go to sleep but, no, Peggy said that I was getting up in the night to photograph the eclipse. I guess that settles who is in charge. Oh, I forgot to ask how you are doing with the Mike Brown Solar System course. I didn't hear anything from anybody. I've really enjoyed it. Some of the lecture videos were filled with references to possible mathematical models used to determine basic facts about Martian weather and climate, and I was worrying that we would have to prepare our own models on the quiz. I think I actually had a bit of test anxiety. Wow, how did that come out. I haven't had to take a real test for many years and I actually like doing all of this stuff. Anyway, I downloaded the quiz and it was mostly multiple choice and easy enough if you just listened to the discussions. I especially liked the discussion how the temperature of Mars was first determined and then how it was determined to have water. In about 1966, the black body radiation from Mars was measured with a telescope and the temperature of Mars could be measured at many different locations and latitudes. The black body radiation is less than the 300 Kelvin or so for Earth or 5800 K for the Sun, but at low wavelengths of about 10 micrometers, the Martian black body radiation is much higher than the reflected solar radiation. And can be easily measured. Then water was determined in the Martian atmosphere by spectroscopic analysis by using the Doppler shift between the water absorption wavelength in the Martian atmosphere and the absorption of water by Earth's atmosphere. The Doppler shift allowed for compensation for the Earth's impact on the measurement. The scientists had to wait for the orbits to be such that the velocity between the two planets was largest. naming of found objects and the infighting regarding first discovery rights. Ok, let's finish up with at least an interactive map of Mars. It's not a photo or movie, but it's really neat and you get to be command and move all over the Martian surface and find for yourself any "canals" or such. A key portion of the maps is the topography so that the elevations of "geological" features are apparent. See if you can't find some of the geologic indicators that are similar to structures on Earth that are known to be caused by flowing water or glaciers. This is considered nearly conclusive evidence that Mars was much wetter than observed today.